Yummiloo is a food adventure that exposes young children to a healthy diet full of colorful foods as they play the “Rainbow Power” game. With fun characters, colorful illustrations, and an easy to use interface, this app will engage and delight little ones as they work on color recognition and learn about yummy and healthy fruits and vegetables. The best apps for young children are those with entertaining music, bright colors, and engaging activities and Yummiloo Rainbow Power has all of these features and then some. The characters are sweet little fruit and vegetable shaped Yum-Yums that help players collect certain foods for the rainbow machine to help get it moving again. As they harvest specific foods for the machine, the animated illustrations and sound effects bring the game to life creating an engaging environment for education and entertainment. The audio and visual aspects of the app are done very well and the developers certainly know how to appeal to young children. The interface is simple for children to use with two options for playing (drag and drop or tap), and the game itself is self explanatory. Children will love playing Yummiloo Rainbow Power not only for the fun game, but also because the illustrations and colors are very charming. The primary message of this app is to teach children the importance of including a wide variety of healthy foods in their diet. The metaphor for filling the rainbow machine with foods varying in color is also to teach children to include different colored foods in their diet as well, and this app does a great job of sharing such an important message. Not only will children learn the importance of a healthy diet, but they will also have an opportunity to practice their colors. In each phase of the game the object is to place certain foods of a specific color into the basket in order to fuel the rainbow machine. They choose their foods from a garden that is full of fruits and vegetables of all colors so this is great practice for young children needing practice recognizing colors. There is also an opportunity for children to learn the names of specific foods. As they select a food to place in the basket the Yum-Yum calls out the name of that particular food helping children learn their fruits and vegetables. The educational quality of Yummiloo is top notch and offers many opportunities for children to learn good eating habits while they practice their colors and food recognition. In addition to the educational quality of the app, the game like quality of this app is also very good. 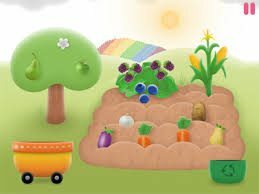 The object of the game is to fuel the rainbow machine with various types of foods, but in the process children are also keeping up with the garden. As they select the correctly colored ripe foods for the machine, other foods are wilting and they must place those foods in the compost bin. Keeping up with the many fruits and vegetables growing and wilting and putting them in the appropriate basket is a bit of a challenge but is also a lot of fun. Another aspect that makes for an entertaining experience is during Beanie’s “Snack Attack”. Beanie is hungry and players must feed him various ripe fruits and vegetables to cure his snack attack. After Beanie is good and full, players are able to return to their game. This fun intermission is somewhat unexpected and helps children stay engaged as they play. It is always great when you find a good quality educational app that is equally entertaining for a good price. Yummiloo is a great purchase especially for parents looking for a fun way to teach their little ones about good eating habits in a fun way. For just under two dollars, Yummiloo Rainbow Power offers an important message in an entertaining learning environment that will keep children coming back time and time again. The user interface and illustrations are great for children making this app not only easy to use, but also very entertaining. There are no social media links or flashy advertisements to distract little ones but parents will want to be mindful of the additional apps area. This area is set up for parents in that you must swipe the screen in a very specific way to gain access to the additional apps. The added security for this area is great and to be honest I am surprised more apps don’t do something similar. Parents can be confident that their children are not only learning good eating habits, but they are doing so with a very safe and easy to use app.